A team of researchers led by Hideo Hosono at Tokyo Institute of Technology (Tokyo Tech) has shown that terahertz rays can be converted to light visible to the human eye. The finding is a breakthrough for functional materials research and could lead to the development of a new kind of terahertz detector. Scientists have successfully visualized terahertz radiation, popularly known as T-rays, using a crystal called mayenite (Ca12Al14O33). Their method cleverly utilizes the rattling motion caused by the vibration of oxygen ions inside the cage-like structures of the crystal. In recent years, there has been growing interest in developing practical devices based on terahertz technology. With wavelengths longer than infrared light, T-rays are considered safer than conventional imaging systems. They are already used, for example, at airport security checkpoints, and are starting to be used more widely in areas such as medical screening, food inspection and analysis of artworks. The visualization of terahertz light itself, however, has so far proved challenging. Now, Hideo Hosono of Materials Research Center for Element Strategy, Tokyo Tech and co-workers in Japan, Ukraine and the US have devised a simple approach to convert T-rays to bright, visible light. Their findings have been published in ACS Nano. First, the study involved beaming T-rays onto the mayenite crystal using a gyrotron. This led to the vibration of oxygen anions, which collide with the inside walls of the cages within the crystal. Each cage has an inner diameter of 0.4 nanometers and an outer diameter of 0.7 nanometers. "The rattling of oxygen ions within the cages promotes upward energy conversion," Hosono explains. "Strong and frequent collisions of the oxygen ions induce electron transfer to neighboring empty cages. The excitation of the oxygen ions is key to the emission of visible light." Spectroscopy measurements confirmed that the visible light originated from vibrations caused by the free-moving oxygen anions. The researchers took care to rule out the possibility of other sources such as black body radiation and surface polarization as reasons behind the production of visible light. The study is an example of strategic research on functional materials under the Element Strategy initiative supported by Japan's Ministry of Education, Culture, Sports, Science and Technology (MEXT) and the Japan Science and Technology Agency (JST). 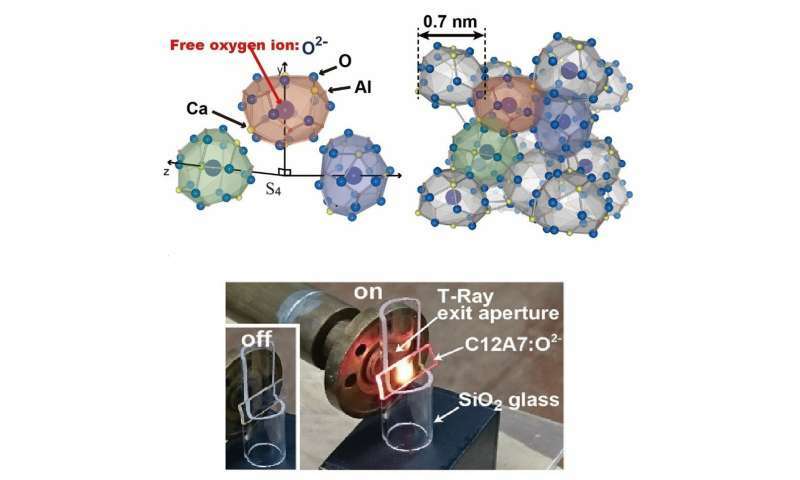 "The crystal in our study is just composed of calcium, aluminium and oxygen, all of which are in the top five of the most abundant elements," says Hosono. "So, it's one of the most inexpensive materials, at around 15 cents per kilogram." Despite its simplicity, Hosono says that the crystal has many exciting properties due to its nanostructure. Drawing on 20 years of research, his group has already succeeded in demonstrating that the material has excellent catalytic properties for ammonia synthesis and superconductivity. Best known for his pioneering work on iron-based superconductors, Hosono says that the current study marks a new research direction. "Our group has been concentrating on the cultivation of new functionalities using abundant elements, but it's the first time for me to focus on ionic motion—this is completely new," he says. The findings could lead to the development of a T-ray detector, as no such conventional detector has yet been designed. Hosono adds: "Right now, our material is good at detecting strong terahertz radiation. The challenge will be how to adjust the sensitivity." His group has also reported that the oxygen anions can be substituted with gold or hydrogen anions inside the cages. By making use of these different anions, it may be possible to develop detectors that emit different-colored light in future.